Oh my, how I’ve MISSED you!!!! 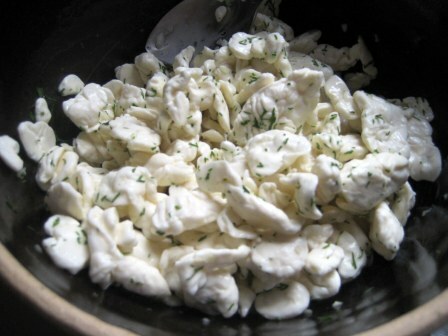 Over the weekend, I shared a gallon of goat milk with the kids to make one of Katie’s favorites: farmstead [herbed] cheese curds. They’re great for snacking, tossing onto a fresh green salad, etc. Two days earlier, I cultured one quart of buttermilk [with goat’s milk, naturally] following the purchased ‘starter’ directions. I use the buttermilk as a starter for most of my soft cheeses. 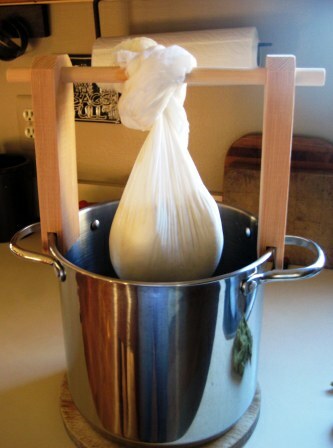 I used one of my fav cheesemaking recipes from ‘Goats Produce Too’ by Mary Jane Toth. I modified her cheddar recipe by simply halving the recipe and omitting the pressing/aging. The most difficult part of the recipe is deciding which herbs/seasoning to add???? This batch was ‘seasoned’ with fresh dill and one clove of garlic! YUM!! In support and recognition of local farmers, artisan food producers and sustainable food. Enjoy!! The right tool for the right job makes ALL the difference to the craftsman! A simple block of scrap wood ( I still want to apply some mineral oil to the surface), specially made to fit over the lip of my SS pot! It doesn’t take much to make this old gal HAPPY! To press or NOT to press ~ Cheese Curds? I have not YET ventured into the world of HARD or PRESSED cheesemaking since my on-going love affair with my goats. Did you know that cheese is basically milk, a starter culture & rennet. The difference between one cheese and another is the temp the milk is heated to, the type of culture added and the way it is ‘processed’. Awhile back, a fellow goatie told me of herbed cheese curds she delighted in when traveling to and from Wisconsin to visit a daughter. 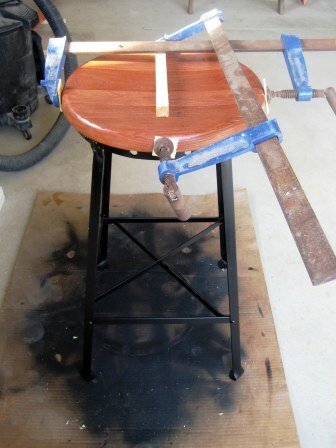 Hmmm…why can’t I attempt to make a HARD cheese…just short of pressing, waxing and aging? I have made my herbed cheese curds (with my goat milk) three times now, and appears to be a big hit with everyone who tastes it! Once again, add a different herb for a different variety…it’s great for snacking or tossing on a salad, etc. If I can do it, you can make it too! You’ll need 1 gallon fresh goat milk, 1/4 cup cultured buttermilk (a mesophilic non-heat loving culture; this is your starter), 1/2 teaspoon liquid rennet and 1/4 cup cool water. Warm milk to 88 degrees F. Stir in 1/4 cup buttermilk and allow milk to ripen for 1 hour, maintaining temp at 88 degrees. Add 1/2 teaspoon liquid rennet to 1/4 cup cool water and add to milk. Hold temp at 88 degrees and allow to ‘set’ for 45-minutes. 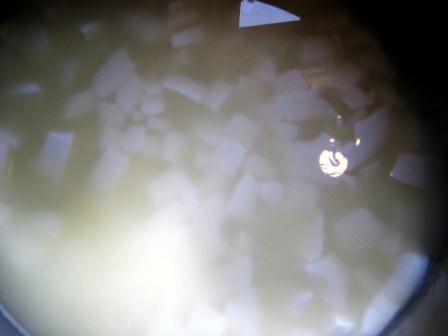 Curds and whey should be visible. Cut into 1/4-inch cubes and allow to rest for 20-minutes. Stir gently while increasing the temp from 88 to 98-degrees ~ slowly ~ over a 30-minute period. Then, keep stirring gently at 98 degrees for additional 30 – 45 minutes until the curds no longer have a custard-like interior. 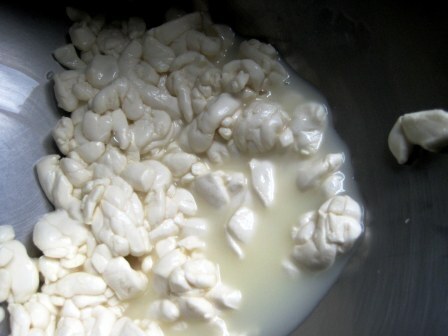 Allow the curds to settle to the bottom of the pot. 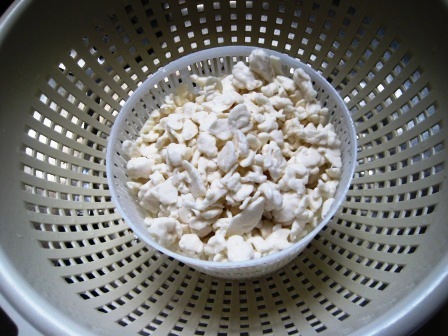 Pour off they whey; drain the curds in a colander for 10-minutes. 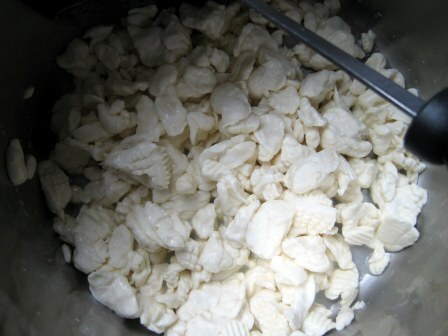 Place the curds back into the pot and gently break-up the curds with a spoon. Add 2-teaspoons cheese or kosher coarse (non-iodized) salt. Mix well. Keep the salted curds warm at about 98-degrees by placing the pot in a sink of hot water for 1-hour stirring every so often. After the salted curds have set for an hour, drain off any liquid. 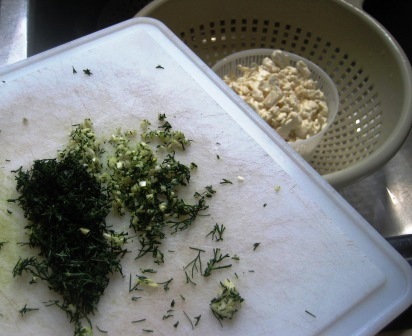 Add fresh minced herbs, garlic, etc to taste and stir gently (you want the curds to remain in tact). Place herbed curds into a colander lined w/cheesecloth (I used a ricotta ‘basket’ mold). 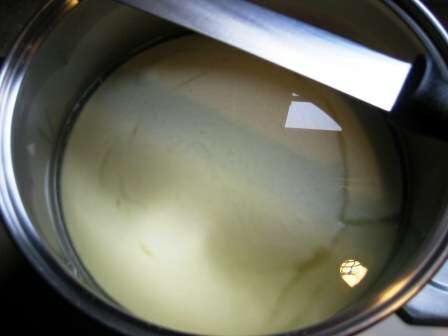 Allow to drain for 2 – 3 hours, stirring once or twice to keep curds separate. Refrigerate and enjoy! 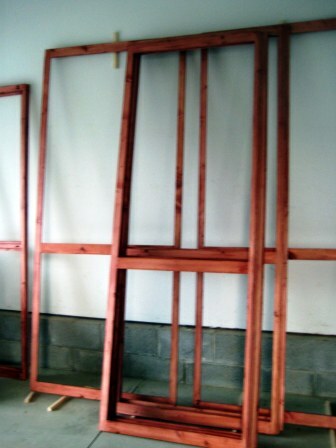 Hubby is working on making all the screen panels. The last two panels for the door were 4-inches too big! GAK! Had to re-fabricate more panels to replace the slightly too-big over-sized door panels!! Round two. GAK! Another half-inch off! I think I would have had a major melt-down by now, but hubby persevered!!? What happened to… ‘measure twice and cut once?’ Don’t do anything when you’re in a hurry! Murphy’s Law: If it can go wrong – it will go wrong?? 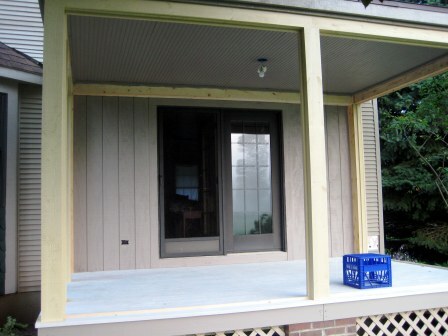 Our projects always seem to take longer than initially planned – does that ONLY happen to us? In the meantime, I’m able to squeak in a few fiber & extra projects, to calm my nerves, before I drop from exhaustion…and IF my fingers still work. 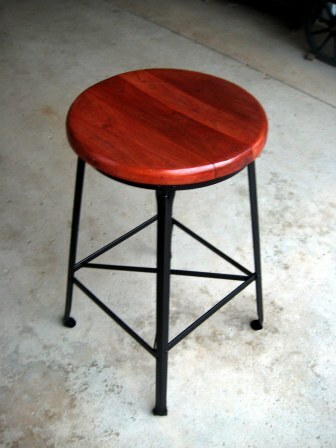 I found this heavy-duty/industrial ‘lab’ stool at the flea market for $5. 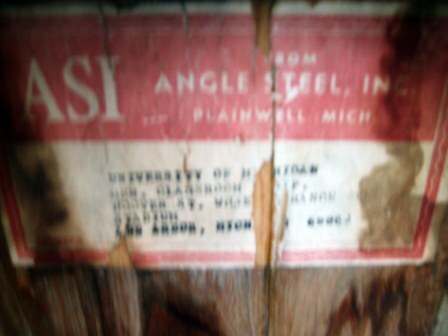 The label reads property of U of M.
Not sure where or how I’ll use this stool…yet. 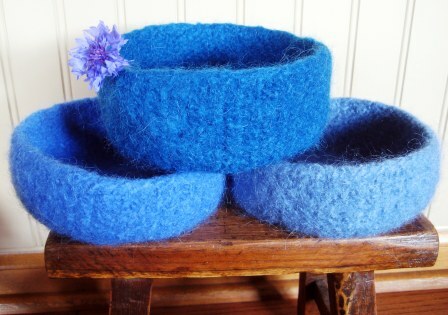 A Sheepy Hollow customer mentioned they wanted a ‘cornflower‘ blue felted sheepy bowl. I checked my fiber stash and came up with three different ‘blues’. I haven’t had a chance to needle felt a sheep on it yet. 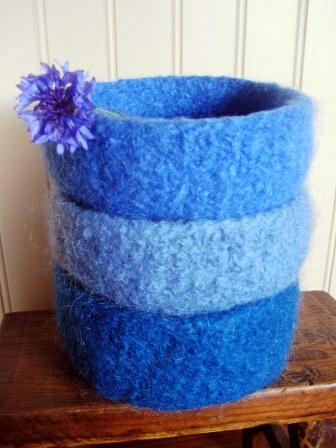 Hmmm….which one comes closest to cornflower blue? 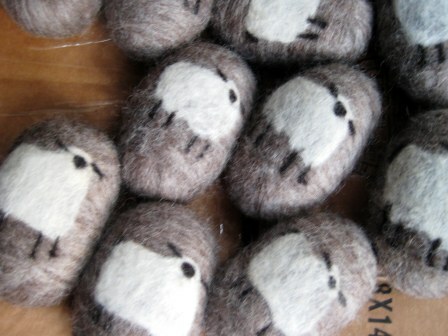 …and, I’ve been felting more ‘sheepy’ soap (soap wrapped in wool with a sheepy motif) for the fiber fest I’m vending at Mt. Bruce Sheep Station at the end of the month. 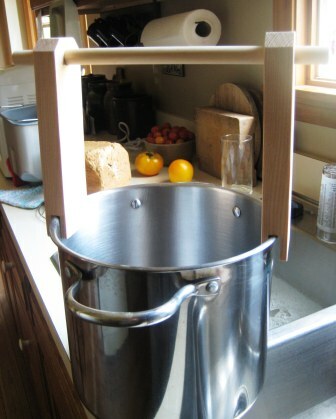 In the kitchen, I’ve also been making cheese for my chickens! Yup, for my chickens! I have a surplus of goat milk right now that I haven’t had much opportunity to do anything with…and I can’t bear to DUMP. So, I add a little A.C. vinegar to separate the curds from whey and viola ~ cheese! I guess the chicks can use a little extra calcium, yes?! They’ve grown quite fond of my cheese treat and usually accompany me during my milking routine! Take care! I hope you’re enjoying good, clean family fun this holiday weekend! Ricotta ‘cheese’ isn’t cheese at all! 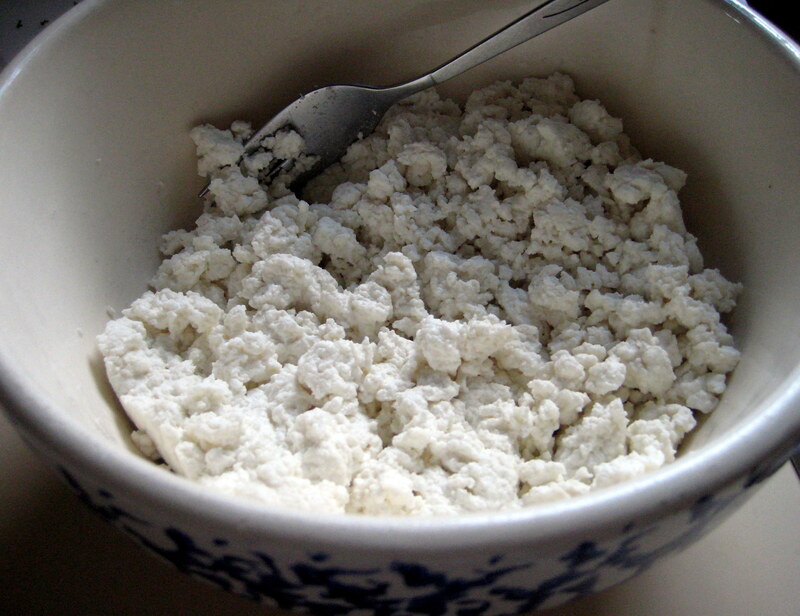 Ricotta is usually made from goat’s or sheep’s milk. Ricotta ‘cheese’ is a creamy by-product of the cheese manufacturing process and thus is technically not really a cheese. ‘Ricotta’ means “re-cooked” because the product is cooked twice, once during the original process and then again to make the ricotta. 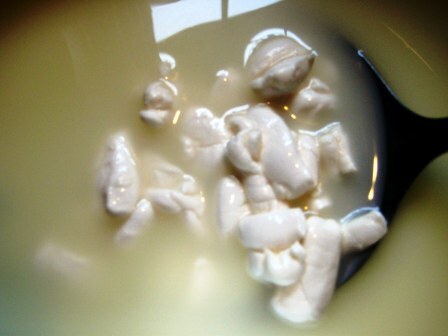 It is created from whey, a watery substance left over from the milk, which is drained off when making hard-cheese such as provolone or mozzarella. Ricotta cheese most likely originated in Rome, Italy, where the people invented many entrees and desserts featuring the fresh, soft cheese. Ricotta is most often used in Italian cooking, typically as cheese filling for cooked pasta dishes such as lasagna, manicotti and ravioli. The cheese blends well with tomato sauces. It also makes great dips and spreads and dessert fillings for cannoli and blintzes. 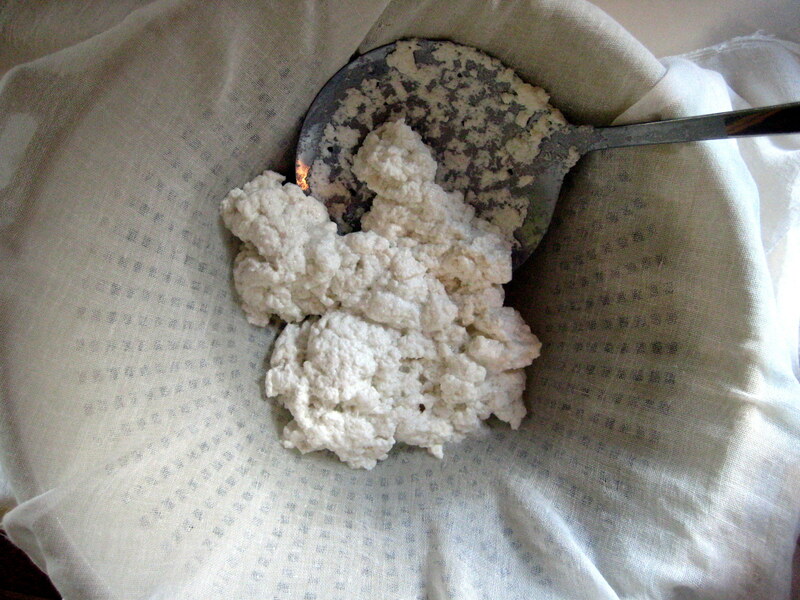 It is the main cheese used for cheesecake. In a large stockpot, heat 1 gallon whole goat’s milk to 195 degrees F. Slowly add ¼ cup apple cider vinegar and stir gently with slotted spoon until separation occurs (about 2 minutes). HINT: You may place the pot directly over medium heat and slowly bring to a boil, stirring occasionally – OR – place in a double boiler so you don’t scald the milk! Gently ladle the cheese into a strainer lined with fine mesh cheesecloth and allow to drain over a large bowl for 20 minutes. Discard the liquid. Add salt to taste. 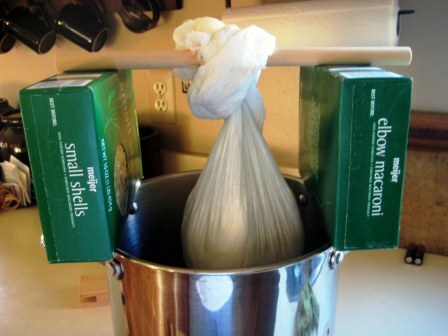 Store the ricotta covered in the refrigerator for up to 5 days. 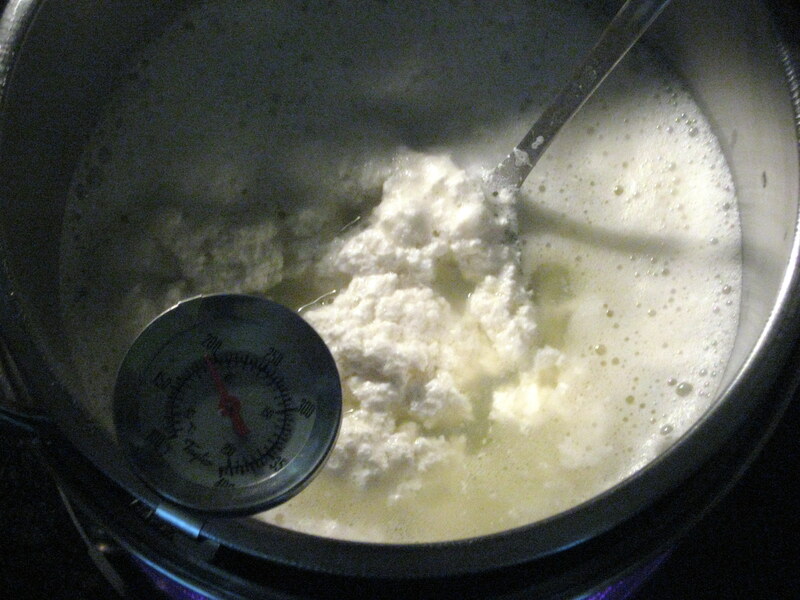 In a large stockpot, combine 2 quarts whole milk, 1 cup heavy cream, and 1/2 teaspoon salt. Place the pot over medium heat and slowly bring to a boil, stirring occasionally. Add 3 tablespoons lemon juice and reduce heat to low. Simmer, stirring occasionally, until the mixture curdles, about 2 minutes. Pour the mixture into a strainer lined with fine mesh cheesecloth and allow to drain over a large bowl for 1 hour. Discard the liquid. Store the ricotta covered in the refrigerator for up to 2 days. Manicotti Sauce: 6 Tablespoons olive oil, 1 clove garlic (minced), 1 medium onion (minced), 2 Tablespoons chopped parsley, 32 ounce can whole tomatoes, 16 ounce can tomato sauce, 1 teaspoon salt, dash pepper, 1/2 teaspoon basil. To prepare sauce, heat oil in saucepan; Add and saute with garlic, onion & parsley. Add remaining ingredients and simmer uncovered for 20 minutes. Manicotti (pasta) Filling: 15 ounce ricotta cheese, 1/2 pound shredded mozzarella, 1 Tablespoon parsley, 3 Tablespoons parmesan cheese, 1 egg lightly beaten, 1 package manicotti pasta ‘shells’. 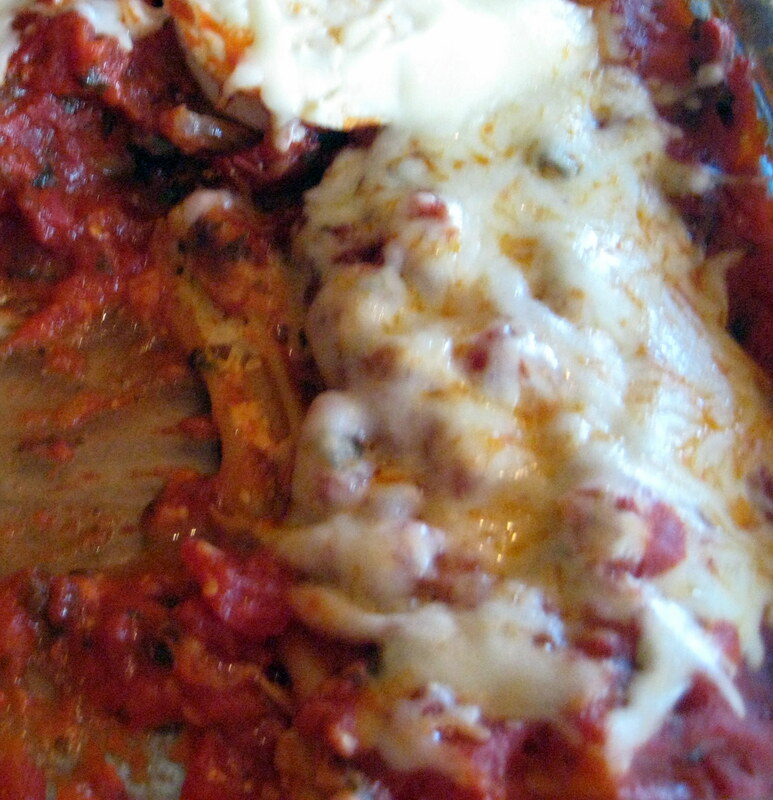 To prepare filling: Combine all filling ingredients (use 1/4 pound mozzarella) except manicotti pasta ‘shells’. Fill UNCOOKED pasta ‘shells’ with cheese filling. Pour a thin layer of sauce into bottom of glass 9X13 inch baking pan. 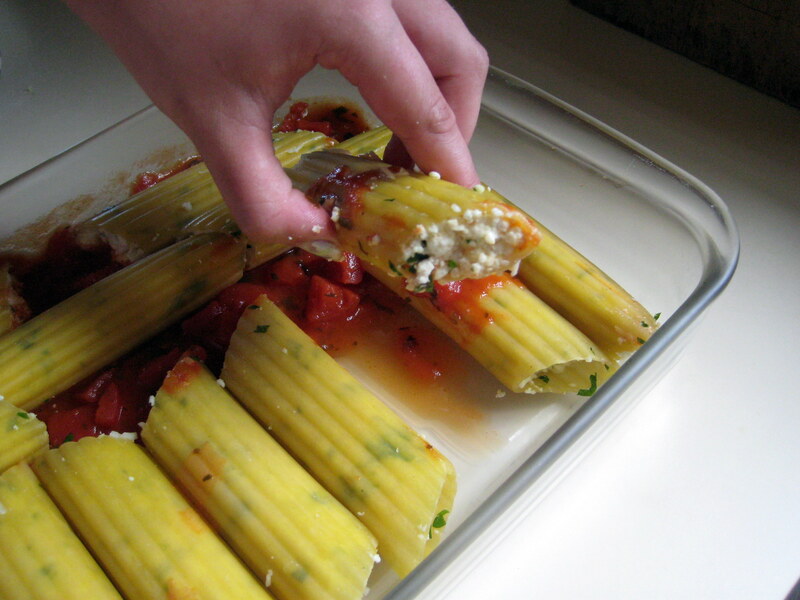 Arrange filled manicotti in single layer in pan and add remaining sauce until completely covered. Cover baking pan with parchment and tin foil to create seal. Bake at 400 degrees F for 40 minutes. Remove foil and add mozzarella to top and return to oven for about 5 minutes until cheese is melted. Serve with fresh salad greens and garlic toast. Enjoy!